From greek newspaper ‘Kathimerini‘. The mural dates from 1568 and anyone can see it in Moni Docheiareiou in Mt. Athos. The monastery of Docheiareiou appears to date back to the early years of the eleventh century. Hairamess, I absolutely agree with Original21. 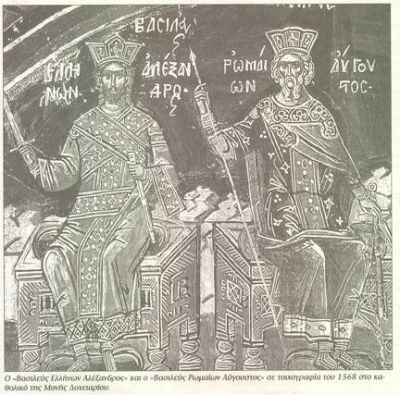 As you have written, the Alexander that you PROBABLY think is the EMPEROR of Byzantium couldn't be named as KING of Greeks (HELLENES) at the mural. So first of all search the sources and don't guess. To the guy above: if you have absolutely no clue about something, better not write anything. The Mural shows 4 kings of antiquity, namely Alexander the Great, Ceasar, Nebuchadrezzar of Babylon and the King of Persians. Not to be confused with Alexander the Great, this is probably Emperor Alexander of Byzanthium.